Seattle Code Camp started with a Keynote from Microsoft’s Jeremy Foster and he shared a slide with all Microsoft MVP (Most Valuable Professionals) and FTE (Full Time Employee) who were speaking at 09/09/2017 Seattle Code Camp. My 1st Session on AntiPattern was in Room#103 at 11 am -12 pm. I had a brief introduction and begin with the presentation. As already set the expectation with the audience, I kept it very interactive and many participated well to share knowledge and experiences with others. Some of the attendees even spoke to their friends in the lunch break and recommended them to attend my next session. Some of the attendees returned for the 2nd session for DevOps at 1-2pm and some mentioned that it was the best talk they attended. Well, I thank them for their kind words and patience to provide me an opportunity to share my thoughts with them. I have done an official Technical Review of a packtpub title “Mastering ASP.NET Web API”. This book has total 13chapters and available for purchase in all leading bookstores and online. You can also purchase this directly through the packtpub link provided above. Seattle Code Camp 2017 is here 09/09/2017 and I will be speaking on two hot topics which will benefit software developers who really care about their craft. DevOps is not a “Packaged Solution”. I.e. You cannot buy and install it. DevOps is a “culture”, where development, test, and operations work together in a collaborative manner to automate delivery of quality software. DevOps culture develops “production-first mindset”. I.e. applying DevOps ensures that your code is always ready to be deployed to production. First thing DevOps offers is that, it breaks the “Wall of Confusion” between development and operations team. These two teams have different agenda and expectations when it comes to software delivery and deployment. DevOps breaks the wall of confusion between teams and fosters better communication and collaboration throughout the application development lifecycle and results into better visibility and small frequent deployments together. DevOps Benefits and ROI – Source, Forrester Research Inc. Improved IT operations efficiency. Saving 50% of allocated IT operations support. Improved developer productivity with faster, automated release processes. Developers saw a 15% improvement in productivity. Improved tester productivity with faster, automated release processes. 20% productivity gain with their deployment of the Microsoft DevOps solution. Faster recovery from failures and reduction in release risk. Reduce time-to-resolution per incident by 2 hours. Reduced cycle time by as much as 99% and more frequent deployments. Increased customer satisfaction and also gained new business. Faster speed-to-market for new features, products, and services for customers. 20x more, leading to increased sales. Improved release quality. Successful releases with a reduction in errors increase in release reliability, and less time on remediation of release errors. Prime objective of DevOps is to “quickly ship the highest quality software to the end customers”. To make this happen DevOps needs to be implemented across all the phases of software development and delivery. The workflow model below shows how teams go through four phases and contribute towards DevOps adoption. Plan – Backlog represents well-defined and prioritized user stories with proper acceptance criteria etc. Develop & Test – Development will include good quality code written, debugged, code reviewed, checked-in including unit test coverage as appropriate. Testing will include verifying the user story’s acceptance criteria, possibly followed by performance and integration tests etc. Release – Whenever a new version is ready and a sprint end, an automated process is used for deployment. Monitor and Learn – After release team can gather information related to how customers use the application /services and continue to monitor health of application. Collaboration – Building code and running unit tests on each check-in small or big ensures that code is ready to be deployed. Then, deploying it to at-least production like environment and successfully performing tests there ensures that Dev and Production are in collaboration. One major key aspect of DevOps is automation of software build, test, and deploy. DevOps automation enables continuous value delivery. Let’s see the DevOps Automation process workflow. Development – This is where a developer writes code in their local development environment. Version Control – This is version control team uses to check-in code to the repository. E.g. Git, TFS, SVN etc. Build and Unit Testing – This is where DevOps Continuous Integration (CI) takes place. At this step, code will build with latest checked-in code and latest packages and dependencies as applicable. If there are unit tests then all unit tests will be executed to ensure that there are no collateral damages caused within the code base. If Build fails then a notification will be sent to the developer who submitted the build. Many teams have various policies and channels set up for this. For example, a bug is created with details when a build fails and team’s slack channel will receive notification when a build fails. Automated Acceptance Testing – If build succeeds then a set of acceptance tests can be executed automatically to verify that code is working fine. Any failure in an acceptance test will trigger a feedback initiated to the team and process will again start from beginning. User Acceptance Test – Passed automated acceptance tests ensures and triggers the code to be promoted to UAT. Release – Upon passing UAT, code can be released to any environment or production or production like environment. Manual push of code to production is known as Continuous Delivery (CD). DevOps is technology agnostic and any development environment on any platform can fully adopt DevOps culture and can continuously deliver quality software to their customers. Here some SDLC phases and tools which will fit in and can help to setup end-to-end DevOps pipeline for your technology and platform of choice. Capturing and tracking (TFS, VSTS, JIRA, ServiceNow. Documentation or Wiki page (Microsoft Teams, SharePoint, Confluence. Collaboration (Slack, HipChat, Microsoft Teams). SCM (TFS, VSTS, Subversion, Git, Mercurial. IDE (Eclipse, IntelliJ, Visual Studio). Repository management (Artifactory, Nuget, Nexus). Build tools (MSBuild, Jenkins, Bamboo). Configuration management (Chef, Puppet, Ansible). Functional testing (MSTest, NUnit, JUnit, Cucumber, Selenium). Performance testing (SOASTA, Apache Test Bench, Microsoft Load and Performance Test). Primarily Azure is known for Pay-As-You-Go but it has some great features and some of those can be used free of cost. 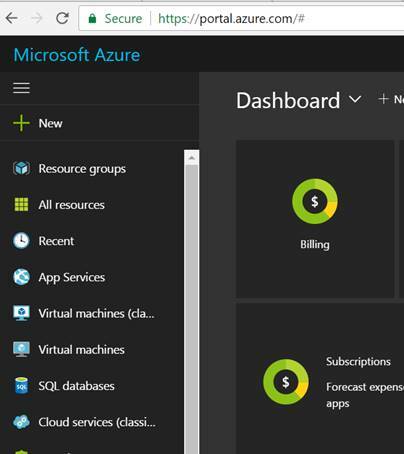 One such feature is Azure App Service that allows you to host your web application on Azure, free of cost for life. 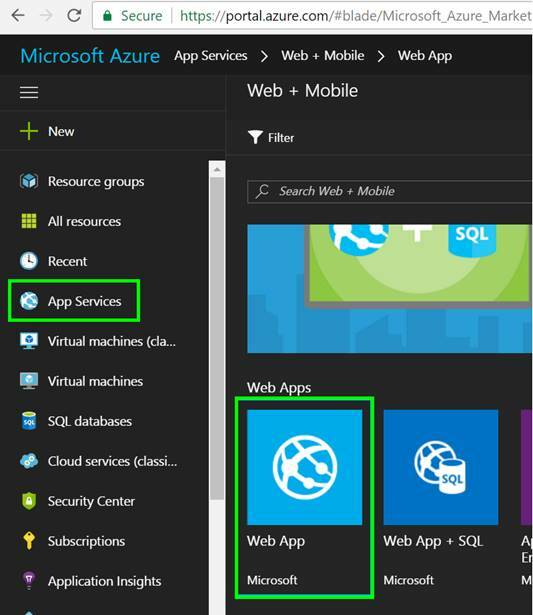 Azure App Service offers a variety of applications which can be hosted under Azure App Service, but this article is limited to Web Apps. You can learn more about various types of application. Click on App Services and you will see your App Services panel as shown below (you will see your services listed if you have any; which were created previously). Click on “+Add” and choose Web App from the screen. From the next screen, click on “Create”. You may want to take a moment and read the text shown on the screen. I personally admire the Azure capabilities to even host PHP, Node.js, or Python and many more application types. Now, the next screen will let you specify the name of the free app service. 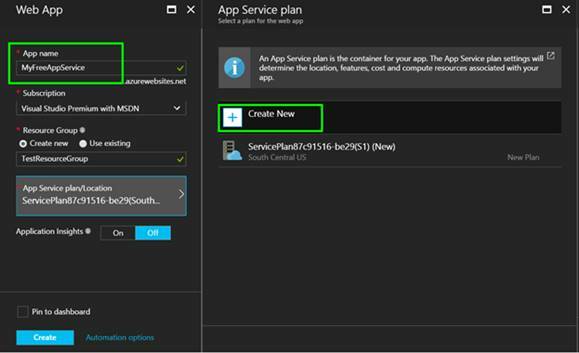 After filling in the details on the left pane, select “App Service plan/Location”, and from the right pane, select “Create New”. A new window will appear as shown below. 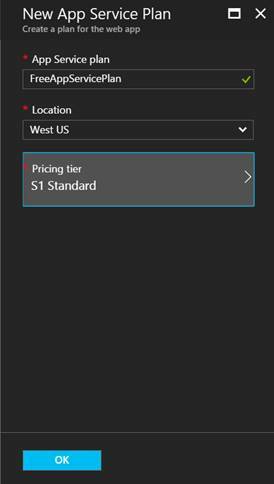 Enter Name and choose a location of Azure Data-center to host your app service, and select Pricing Tier. Click on Pricing Tier will popup a new screen; scroll to the bottom and you will see a free service tier option, as shown below. Make note that it offers only 1GB space max, and it will be deployed on a shared infrastructure i.e. there might be other websites hosted under the same IIS / Infrastructure. Also, note that it clearly and explicitly calls out 0.00 cost per month, i.e., it’s completely free and for life. 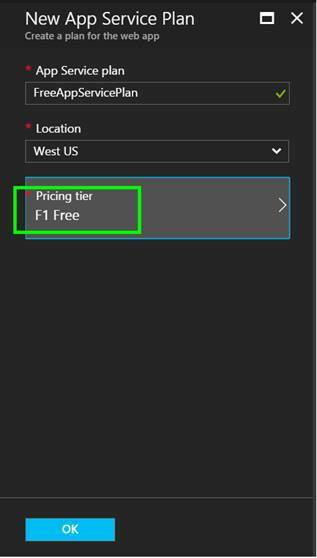 Click on “F1 Free” tier and click “Select”. Now, “App Service Plan” pane will update to reflect the changes. Verify the details and click OK, and now your “Web App” pane will pop up and show the changes applied to your App Service Plan and location. Verify details and click “Create”. 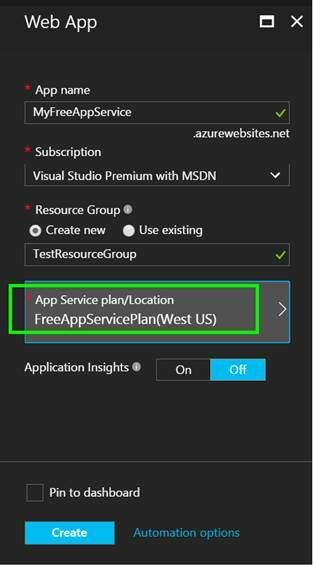 Your Free App Service deployment will start and you will notice that your “MyfreeAppService” appears under “App Services”. Click on the “MyfreeAppService” to explore this App Service and a whole new pane with lots of options will load, as shown below. To Test this App Service, click on “Browse” button from the top of right pane and you will notice that website will load in your default browser. This website shows nothing worthwhile; that is because we just created an Azure App Service which is Free and has no application code in it. 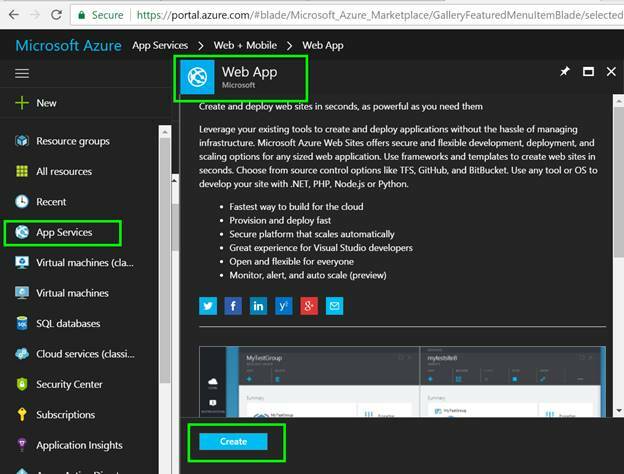 We need to deploy the application to this newly created Free App Service on Azure. Microsoft Visual Studio and DevOps CI/CD are fully featured to let you deploy your web application to this app service and a separate article will better justify this requirement which is next logical step. Can the Pricing Tier be changed? 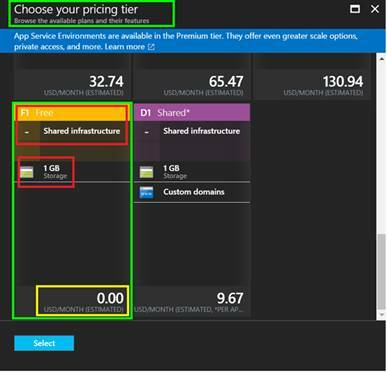 Yes, once your application starts to have more features and you want to make it scalable, secure, and take advantage of Azure App Service features, you may want to change Pricing Trier from Free to Paid. This can be done very easily and quickly; by selecting “App Service Plan” and then choosing the Pricing Tier which aligns with your evolving business and application needs.